He was born on 23/9/1886 at 18 court 3 Allen Street in the St Phillips area of Sheffield to Septimus & Anne Greaves (nee Biggins ). They had six other children, Elizabeth born 1870, Septimus 1874, Ernest 1876, William 1878, Emily 1883 and John 1888. My grandfather was a table knife cutler by trade. He married my grandmother Ethel Seymour on 6/8/1905 at St Pauls Church Norton Woodseats. My grandfather resided at 4 Valley Terrace and my grandmother 29 Valley Road at the time of their marriage. From the 1911 census records I know they lived at 67 Heeley Green. They had three children , Bertha born 17/11/1905, Ethel 7/7/1910 and Fred my father born 13/1/1913. The following information is from Fred's service papers. He enlisted for the British Army in Sheffield at the age of 29 years 348 days. His address by then was 25 Heeley Green. His medical history sheet gives his height as 5 feet 6 inches and weight at 128 lbs. He was assigned to the 8th Battalion York and Lancaster Regiment and from a copy of a letter sent by his wife in October 1914 to Infantry records it suggests he was posted to Frensham. The 8th York & Lancaster along with other battalions formed the 70th Infantry Brigade as part of the 23rd Division. On 28th of August the Brigade embarked from Folkestone landed at Boulogne and moved on to a rest camp at Ostrohove. In September 1915 the 23rd Division moved up to the front where the 70th Brigade took over the trenches just south of Armentieres. On the 24th/25th September 1915 the Division took part in the Battle of Loos. To better train the troops the 70th Brigade was transferred to the 8th Division on October 18th 1915. On the 4th April 1916 the 8th Division moved up to the Le Boisselle – Thiepval sector where the 8th Battalion York & Lancs occupied trenches to the left of the sector in front of Authuile Wood. The ground occupied by the 8th Division was the most difficult of the whole front, no mans land being exceptionally wide and the attack by the 70th Brigade would have to be made beneath the southern spur of the Thiepval salient which was commanded “in enfilade” by the Germans. K O Y L I and the 8th York & Lancs forming the assault battalions. After the artillery barrage lifted, the battalions began their assault near the village of Ovillers at 7.30 am 1st July 1916. 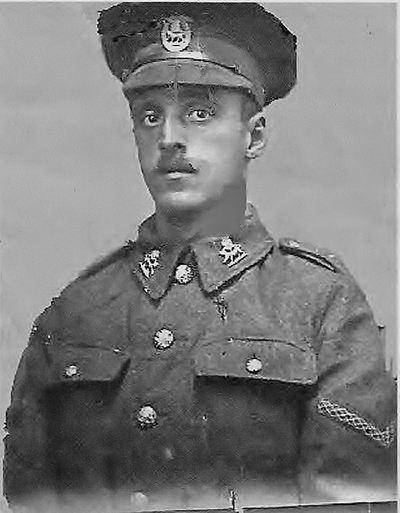 Immediately after leaving their trenches the battalion came under heavy machine gun fire and most of the men were killed or wounded , Fred being one of the fatalities. From information obtained via Commonwealth War Graves Commission, It appears that Fred's body was exhumed from its original grave and reburied in Serre Road cemetery no 1 On 30th June 1922.